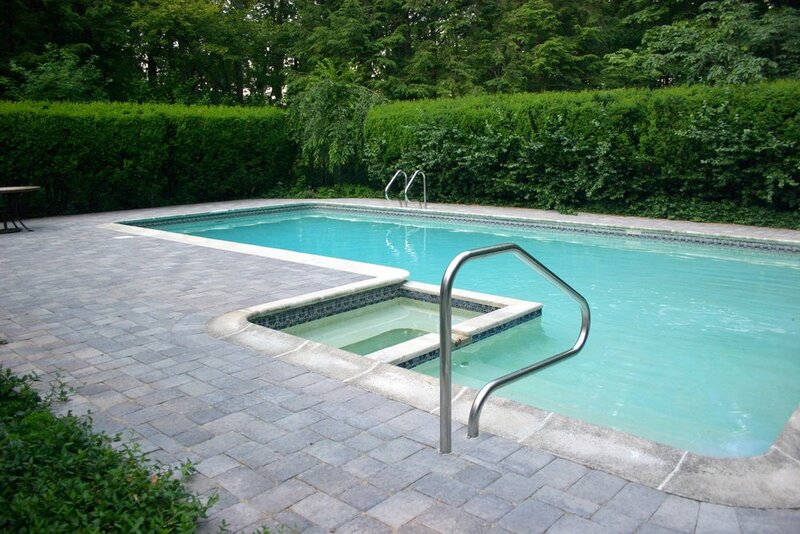 Pool Decks Landscape Design and Installation in Lincoln MA | Premier Pavers & Hardscape Co. Nothing says summer more than splashing around in the pool. The right pool deck and coping achieves a particular look as well as poolside safety. Pool decks can be constructed using clay bricks, bluestone, granite, travertine, and porcelain. Whether your pool is rectangular, kidney-shaped, or free-form, a professionally installed pool deck will integrate the pool into your landscape. Mix and match various paver styles to achieve a custom look. Unify various outdoor rooms for a cohesive look. Create a year-round landscape by installing a fireplace or fire pit in your pool deck area. Concrete pavers tolerate the extreme New England summer temperatures better than other options and are cooler to the touch. Permeable pavers have a textured surface, making them non-slip and skid-proof—and safe in both wet and dry conditions.